If you have special requirements such as additional keys, master key, sloping tops, padlock and internal fittings, please call our experienced sales team on 0800 0126777 (standard office hours). What is the purpose of the Budget 4 Door Locker? At school or at work, the Budget 4 Door Locker provides safe, hygienic storage for personal items. This four door budget locker is made of robust steel, and its powder coating is anti-bacterial, anti-fungal, and anti-mould. This locker also includes an airflow venting system to keep its contents clean and dry. 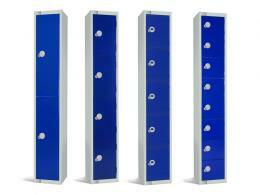 Whether used alone or nested with other lockers, this product provides safe and clean storage for up to four people. Where can this Metal Locker be used? 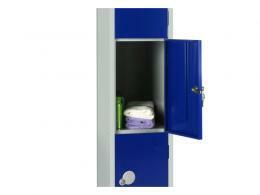 A four door budget locker can be used as a school locker, and office locker, staff lockers, and gym lockers. These metal lockers are outfitted with standard mastered cam locks, making them a safe place to store personal items. This storage locker is useful at schools, factories, and other workplaces where employees need to store money, keys, or other items. At gyms or community centres, these lockers can provide safe storage for up to four people. The anti-bacterial powder coating and airflow venting system makes these lockers great for use in hot or moist environments such as gym locker rooms. Who might use this Locker? Up to four factory workers might store their keys or money in these lockers while they work. Similarly, up to four students could store books and supplies in a locker while they are at school. At gyms or community centres, patrons could store a change of clothes or a water bottle using this product. Anyone who needs to store items while working, studying or playing sports could use a Budget 4 Door Locker. Therefore, the proprietors of these locations might want to provide four door budget lockers to their patrons, students, or employees. Standard one-year parts and labour warranty. Robust, sustainable steel construction with anti-bacterial powder coating. Powder coating also prevents fungus and mould. Includes standard mastered cam locks. Grey carcass with a choice of 5 door colours. 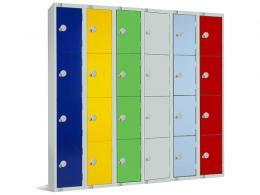 Locker dimensions (H x W x D): 1800 mm x 300 mm x 300 mm. Incorporates nesting holes on all sides and return flange at the base. We can also accommodate special requirements, such as additional keys, master key, sloping tops, padlock, and internal fittings. Please contact our experienced sales team during standard office hours.